What is the best way to give to Covenant Bible Camp? All gifts are welcome, but regular (monthly, quarterly or annual giving) allows us to plan for things from one year to the next. The preferred way to give is a monthly contribution online via your checking account or credit card to where it is 'most needed.' Specific needs are listed in the drop down menu above. Is Bible Camp a registered 501 c(3) Non-Profit? Are donations tax-deductible? Bible Camp is a ministry of Covenant Youth of Alaska, which is named as a member of the 501 c3 tax-exemption group of the Evangelical Covenant Church in Chicago. Covenant Youth of Alaska has a unique IRS EIN number for tax exemption documentation. All donations are tax-deductible, as allowable by law (whether or not you claim the exemption depends on your unique tax situation). When you make a donation online, you will receive a giving receipt via e-mail and can log in at anytime to view and print your giving records for tax purposes. Why does CBC need people, Churches, and Organizations to donate? CBC serves near 400 youth from Western Alaska each summer, mostly from Norton Sound, YK Delta and the NANA regions. Most campers have to fly to Unalakleet to attend camp. Even with discounted airfares, it still costs money. Our registration fee is less than what it costs to run the camp because if we did not, few campers would be able to afford to come. Many communities we serve have high rates of unemployment and some kids who attend camp have parents who cannot afford to pay for their children to attend. 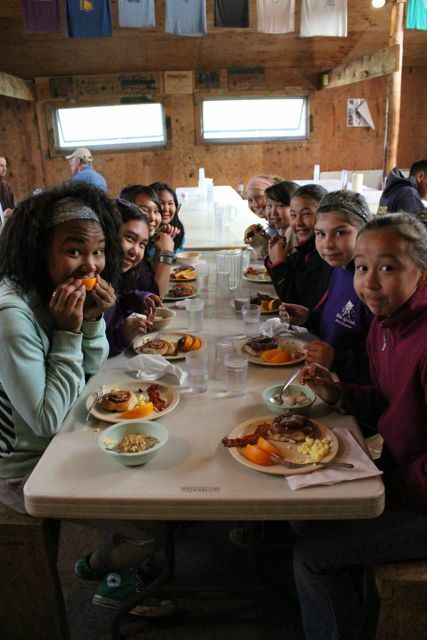 We want to see as many kids in rural Alaska attend camp as possible. It is common to hear campers say their week at camp was the best one all year. Where does CBC get its revenue? How much comes from donors and how much comes from other sources? In most years around 70% of CBC's income comes from camper registration, travel and rentals. Donors fill the 30%. However, it is difficult to measure the value of the service of our volunteers. CBC's volunteer staff served over 40,000 hours in a typical year. Individual donors, churches, local businesses and organizations in the region support the camp to meet specific needs. Unalakleet Covenant Church and other community members make huge contributions in helping with travel to and from the village to camp and with other needs as they arise. Can I include Covenant Bible Camp in my will? Yes, the Covenant Trust Company will help you create a will free of charge, if you donate at least 10% to CBC or any other Covenant ministry. If you already have a will or trust and would like to contribute to Bible Camp, please contact the Camp Director.